Kono and Yuki Secure Kisei League Places: The remaining two vacant seats in the 39th Kisei Leagues were decided on April 21. In the play-offs, Kono Rin 9P (B) beat Ko Iso 8P by resig. and Yuki Satoshi 9P (W) beat Mizokami Tomochika 8P by resig. Kono (right) has made an immediate comeback after being eliminated in the previous league; this will be his 7th Kisei league in a row. He has kept his seat in the Honinbo League and is playing in the current Meijin League, so he is one of only two players (the other is Yamashita Keigo) to be a member of all three leagues. 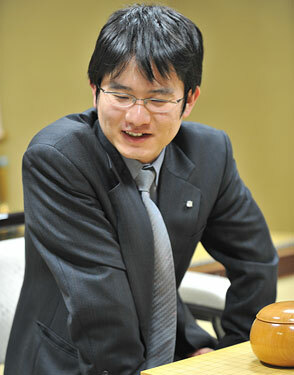 Yuki will be playing in his ninth Kisei league and reappears after a five-year gap; he made an unsuccessful challenge for the 29th Kisei title. Incidentally, he played this game three days after losing the Judan title, so it seems he has not been crushed by this reverse. Japanese Team Plays in Chinese League: This year, too, a Japanese team competed in the Chinese league. Known as the China-Japan Friendship team, it was composed of Ida Atsushi 8P, Yo Seiki 7P, Yo Chito 2P, and Kyo Kagen 2P; apart from Ida, these players were all born in Taiwan. The team played in the C League and took 5th place out of 22 teams. The league was held in Hangzhou City from April 21 to 29; the Japanese team scored two wins, four draws, and one loss, giving it eight points (out of a possible 14). The top three teams are promoted to the B League. Ida, who will launch his challenge to Iyama Yuta for the Honinbo title in mid-May, scored 4-3, Yo Seiki 2-5, Yo Chito 3-4, and Kyo an impressive 7-0. Yamashita Keeps Sole Lead in Meijin League: With a win over Ryu Shikun 9P on May 1, Yamashita Keigo (left) remained the only undefeated player in the 39th Meijin League. He is now 5-0. Ryu’s loss meant that he dropped out of second place. Cho U 9P has won his fourth game and, with 3-1, is now in sole second place. Yamashita is the favorite, but he also led the Honinbo League throughout only to stumble right at the end. (April 14) Yamashita (W) beat Kono Rin 90 by 3.5 points. (April 24) Cho U (B) beat Takao Shinji 9P by 2.5 points. (May 1) Yamashita (W) beat Ryu by resig. ; Hane Naoki 9P (W) beat Ko Iso 8P by resig.